TO CHEW ON: "'I make a decree that in every dominion of my kingdom men must tremble and fear before the God of Daniel. Daniel in the lion's den—what a gripping story. It has all the elements of a good read: a noble hero, jealous villains, a naive king, and an insurmountable problem. But it is so much more than just entertainment. Three things stand out for me in this incident. 1. 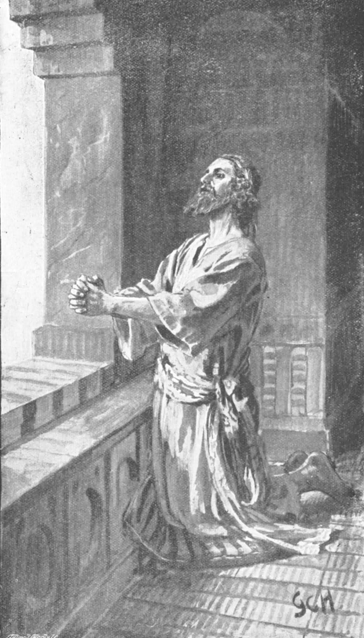 The description of Daniel having an "excellent spirit" (Daniel 6:3). That tells me he had a reputation for good things—good work, making wise decisions, perhaps a pleasing manner. 2. Daniel's unshakeable, even stubborn devotion to God (Daniel 6:10). When it came down to choosing between faith in God or his life, he chose God with not even a flicker of hesitation. 3. The incident resulted in praise and glory going to God, not Daniel, shown by Darius's prayer at the end of the chapter (Daniel 6:25-27). 1. We can make it our goal to have an "excellent spirit." What would that look like? Perhaps a heart of service, a cheerful attitude, a considerate manner, a reputation for fairness... Leslyn Musch in her Truth-In-Action Through Daniel article, calls it "godliness" ("Try to reflect godliness in all you do" - New Spirit-Filled Life Bible, p. 1140). That would imply the that the attributes we see in God would make up an excellent spirit in us. 2. We can stay loyal to God no matter what the consequences. In our time that may or may not be reason for civil disobedience, as it was for Daniel. 3. The goal of all this is the only worth one: that glory goes to God, not us. PRAYER: Dear God, please help me to cooperate with You in developing an excellent spirit within me. May it be the goal of my life to bring glory to You, no matter what the cost. Amen.